Once I decided on the Robot Cake Pops, I started thinking about rocket treats. I came across Rice Krispie Rockets on Southern Belle's Charm's blog a few months ago and thought they would be a fun, not to mention yummy idea for JD's Robots & Rockets birthday party. I've made football Rice Krispie Treats before, so I'm hoping rockets will be just as easy. I haven’t decided if I will be coating them in chocolate yet, but I have a few more months to decide! Note: The simplest way to shape Rice Krispie Treats is with a cookie cutter! i was wondering if i can have your services for rice krispie treat rocket shapes for around valentines days for my boo!or u can let me know where u purchased this cute shape??!! 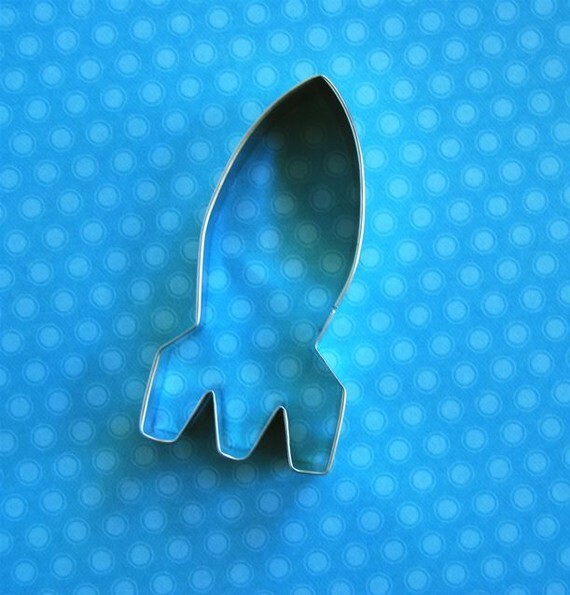 Yes of course, I should have the rocket cookie cutter by this week! Do you want them chocolate dipped?